Luke Weaver put it all together in his third career start, and it came at the A’s expense. 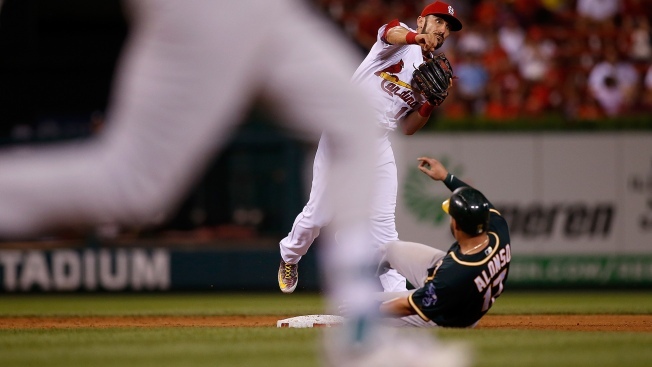 The Cardinals rookie went six innings Friday and gave up just a solo homer to Yonder Alonso, collecting his first major league victory in a 3-1 win over the A’s at Busch Stadium. Weaver, a 23-year-old who was a first-round draft pick in 2013, found the going rough in his first two starts since being called up. But he held Oakland to four hits, striking out seven and setting the tone in the opener of this three-game interleave series. St. Louis, which currently holds one of the National League’s two Wild Card spots, jumped ahead in the first on Jedd Gyorko’s two-run homer off Ross Detwiler (1-3). That would be all Weaver and three relievers would need, as the A’s fell to 55-73, their worst record after 130 games since the 1997 squad went 51-79. Detwiler had been roughed up in his previous two starts, and it looked like more of the same early. He allowed Matt Carpenter’s leadoff single in the first and then Gyrko connected for a two-run homer to center before Detwiler had even recorded an out. But the lefty settled in and surrendered just one more run over his 5 1/3 innings. He struck out six and walked one. The Cardinals have had problems at the closer’s role this season, as Trevor Rosenthal struggled greatly with his command over the first half. He’s now on the disabled list with forearm and shoulder issues. His ninth-inning replacement, Seung Hwan Oh, closed it out against the A’s in the ninth. Alonso led off with a single, but Ryon Healy followed by hitting into a double play to squelch any hopes of a comeback rally. Oh, whose nickname in English translates to “Final Boss,” picked up his 13th save. Alonso, a .354 career hitter at Busch Stadium entering the night, got the A’s on the board in the second, jumping on the first pitch from Weaver (1-1) and launching a solo homer to center that cut Oakland’s deficit to 2-1. Shortstop Marcus Semien, in his first game back from the paternity list after the birth of his son, doubled in his first plate appearance. He finished 1-for-4. Zach Neal (2-3, 5.49) has allowed nine earned runs over his past two starts, spanning 10 innings. He’ll oppose Mike Leake (9-9, 4.56) in Saturday’s 4:15 p.m. game.